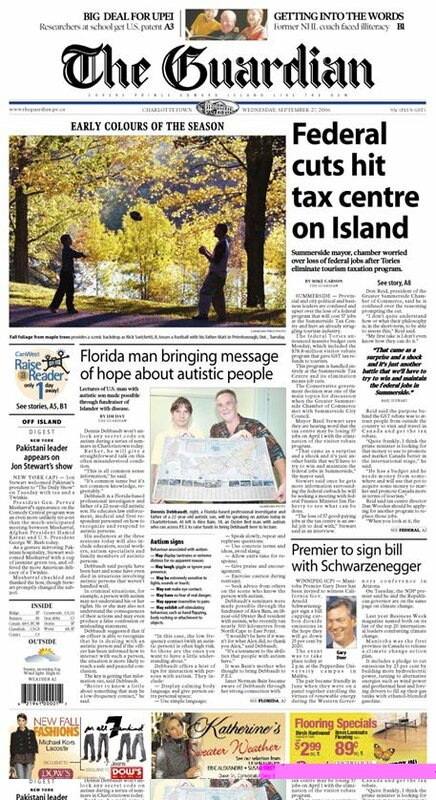 Lectures of U.S. man with autistic son made possible through fundraiser of Islander with disease. Dennis Debbaudt won’t unlock any secret code on autism during a series of seminars in Charlottetown today. Rather, he will give a straightforward talk on this often misunderstood condition. “This is all common sense information,’’ he said. Debbaudt is a Florida-based professional investigator and father of a 22-year-old autistic son. He educates law enforcement, medical and first respondent personnel on how to recognize and respond to autistic persons. His audiences at the three sessions today will also include educators, social workers, autism specialists and family members of autistic persons. Debbaudt said people have been hurt and some have even died in situations involving autistic persons that weren’t handled well. In criminal situations, for example, a person with autism may not understand his or her rights. He or she may also not understand the consequences of their actions and may even produce a false confession or misleading statement. Debbaudt suggested that if an officer is able to recognize that he is dealing with an autistic person and if the officer has been informed how to interact with such a person, the situation is more likely to reach a safe and peaceful conclusion. The key is getting that information out, said Debbaudt. “Better to know a little about something that may be a low-frequency contact,’’ he said. - Seek advice from others on the scene who know the person with autism. Debbaudt’s seminars were made possible through the fundraiser of Alex Bain, an 18-year-old Oyster Bed resident with autism, who recently ran nearly 300 kilometres from North Cape to East Point. “I wouldn’t be here if it wasn’t for what Alex did, so thank you Alex,’’ said Debbaudt. It was Bain’s mother who thought to bring Debbaudt to P.E.I. Janet Norman-Bain became aware of Debbaudt through her strong connection with the international autism community. She hopes Debbaudt’s seminars will result in proper interaction and intervention when Islanders — professionals and the general public alike — deal with autistic persons in any number of situations, most notably ones that hold potential for harm. “I haven’t heard of any great crisis happening here (on P.E.I.) and I hope that’s the case . . . and we can get in here and do some intervention before any great crisis ever does (occur),’’ said Norman-Bain. Once again, good job in making those seminars possible. Well done Alex! Perhaps you ought to give the journalist ( or most likely his sub-editor ) a free ticket to one of the seminars. Then he will be less likely to think that autism is a disease.